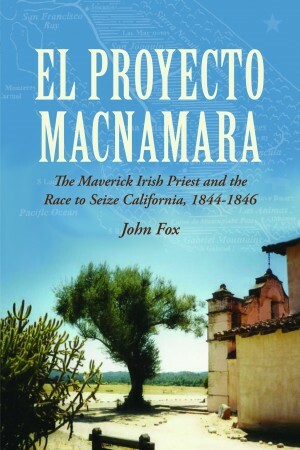 John Fox chronicles the extraordinary tale of Fr Eugene McNamara, the young Ennis native’s attempt to establish a “New Clare” in the far off pastures of California amidst an extraordinary convalescence of international political forces. When MacNamara set out to establish an Irish colony in the Americas, the Mexican North Western province of “Alta California” appeared the perfect place. Ireland’s inefficient agricultural system and the economic ill effects of the 1801 Act of Union had fostered a huge demand for pastures new for a beleaguered Irish nation. For the Irish emigrant it offered a freedom to practice the Catholic religion denied at home. For the Mexican state, Irish immigrants could settle the fragile frontier and secure it from further expansion from the United States. Eugene MacNamara, a young Irish priest, tried to establish ‘New Clare’ in Mexican California. However, on the very day that MacNamara received approval for his colonial dream from the Mexican government, Alta California declared its independence from the Mexican state. Within months US President Polk would launch the US-Mexican War that would lead to “Alta California” joining the US as the state of California in 1950, joining the former Mexican territories of Oregon and Texas in ensuring the dismemberment of the Mexican state. Thusly did McNamara’s grand design find itself swamped by international intrigue. With Mexico viewing Britain as its security guarantor, McNamara became a “British” or “Jesuit” agent in the eyes of Washington, despite being neither. His proposed colony was the subject of concern for figures in Spanish and French government and crucially was targeted as insidious to Polk’s reinvigoration of the Monroe doctrine. Russian and Prussian machinations also found their way into the empty hinterland of Alta California. MacNamara’s grand vision thereby found itself caught between the establishment of the modern United States of America and the withdrawal of the European powers from their American “discoveries”. Forces far beyond the control of the missionary priest from County Clare would coalesce to submerge his ambitious dream. MacNamara’s ‘project’ brought him into conflict with a host of colonial powers and the United States, who described him as a ‘British Jesuit’. The central role of Irish figures as these dramas unfold is evident throughout Fox’s study. He details the oft forgotten international influence of the Irish nation on the course of nineteenth century history. We see Irish priests central to the resurgence of Catholicism in post Revolutionary France, establishing seminaries that served to educate a generation of missionaries, including McNamara himself. We see the impact of “Wild Geese” Irishmen in Bolivar’s fight to shed the shackles of colonialism in South America. We see figures such as Juan Dumfi O’Donojú, Pedro ÓCrouley y ÓDonnell and of course, Bernardo O’Higgins playing significant roles in South American business and politics. And of course we are exposed to the countless Irish figures who gained prominence through the British imperial system itself. The world in which Fr Eugene MacNamara found himself was one in which Irishmen had earned themselves positions of great prominence all over the globe. Men from Dublin, Cork and indeed Clare were to play great roles in history of the nineteenth century. This glimpse, offered by Fox, of the sprawling international influence of the 19th Century Irish is all the more remarkable for the rapid withdrawal from the world at large that marked the Ireland of the 20th Century. Whereas the era of McNamara saw Daniel O’Connell heralded as a great international Liberal leader and abolitionist, it would see the failed Young Ireland revolution lead to Thomas Francis Meagher, Charles Gavan Duffy and (albeit ignominiously) John Mitchel, establish themselves as major figures in the New World of Australia and the Americas. The era of DeValera, on the other hand, was one of decades of an insular Irish nationalism where myopic notions of autarky far outweighed any grand visions of international influence. The sheer extent of Fr McNamara’s Californian vision was a product of his times that would have been unimaginable mere decades later. McNamara’s tale of an Irishman’s optimism swamped by the forces of international politics (and capitalism) grants a compelling insight into what it meant to be an Irishman in the 19th century. It proffers an insight into the complexities of the Irish identity during this period. However, Fox’s account suffers from the lamentable lack of available information about McNamara’s own life and the lives of many of his tales other protaganists. Characters flit in and out of the narrative, marking some impact on the tale of El Proyecto McNamara before fading yet again into obscurity. At times McNamara himself seems pushed into the background as more readily accountable figures such as Lord Aberdeen and US President Polk take to the fore. While Fox does a solid job of conveying McNamara’s story, there is much information still left to be uncovered. Regarded as almost demonical by the highest echelons of US government, McNamara was an Irishman whose grand ambition could not overcome the tumultuous international political forces of his time. His is a tale well worth the telling. One Response to "Book Review: El Proyecto MacNamara"